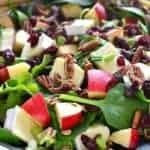 This Cherry Almond Arugula Salad combines fresh baby arugula with sweet cherries, almonds, goat cheese, and grilled chicken for delicious summer salad that’s perfect as a main dish or on the side! I’m prepping myself, you guys. The time is near….and I can taste it. Just one more day and Nora is done with preschool; just one more week and the girls are off for the summer. Like I said, I’m prepping myself. Let the chaos begin! The feeling is the same every year. Part excitement, mostly dread. It has nothing to do with not wanting to spend time with my kids….and everything to do with knowing that a summer with four kids is exhausting. And consuming. And if I feel like I’m scrambling to get things done now….I really need to brace myself! The funny thing? I’ve been doing this for years. And every year I have the same idea: work ahead so I can take the summer off. And every year it’s the same story. Did I work ahead? Of course not. Who has time for working ahead?? So here’s my plan: drink (and post) a lot of cocktails. Ha! Just kidding. My real plan? Make sure I’m treating myself to lots of delicious meals….and then share them with all of you. You can be like my pseudo lunch dates. My sanity keepers. Because clearly I’ll be needing help with that. Sound like a plan? 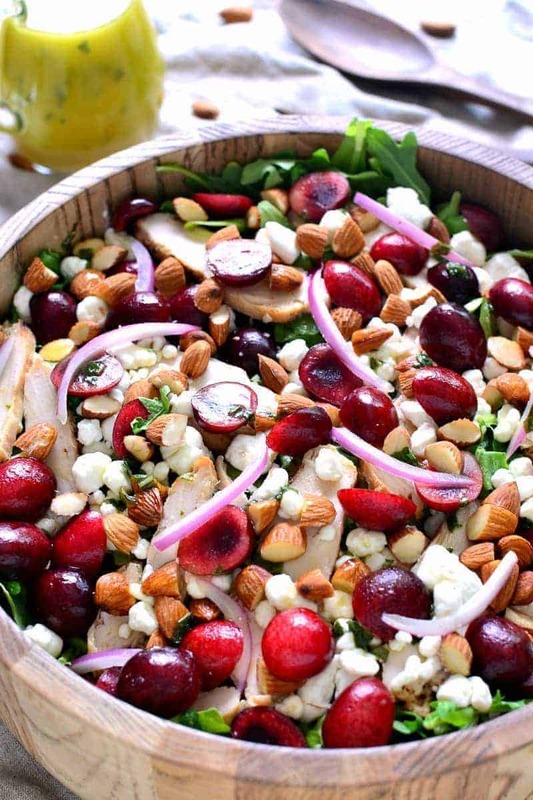 So let’s kick off our lunch dates with this awesome Cherry Almond Arugula Salad. 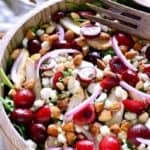 This salad makes use of leftover grilled chicken and is loaded up with all my favorite things – cherries, almonds, goat cheese….and a honey dijon vinaigrette. With basil! It’s the perfect balance of flavors and textures, and such a great way to kick off summer break. And the really great thing about it? 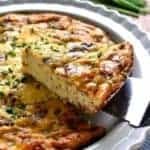 It works equally well as a main dish or side dish, and you can easily add more of any ingredient according to your tastes. You hear that, summer? We’re ready for you. 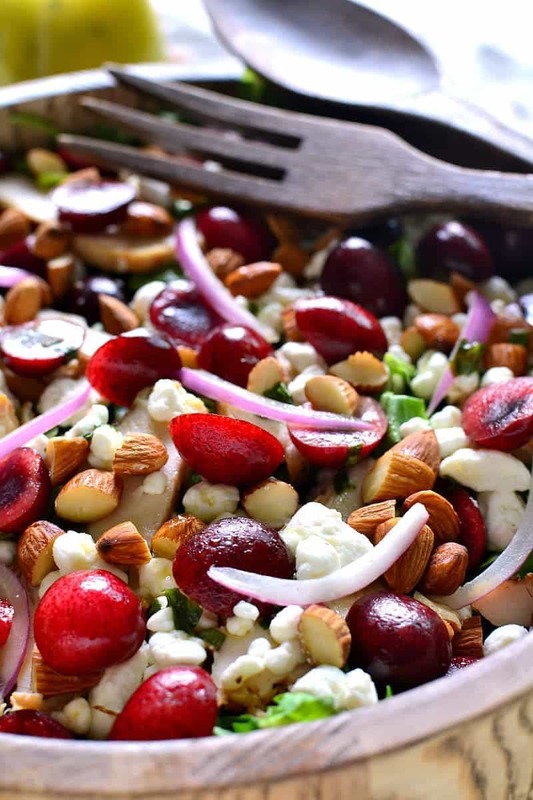 And so is this Cherry Almond Arugula Salad. 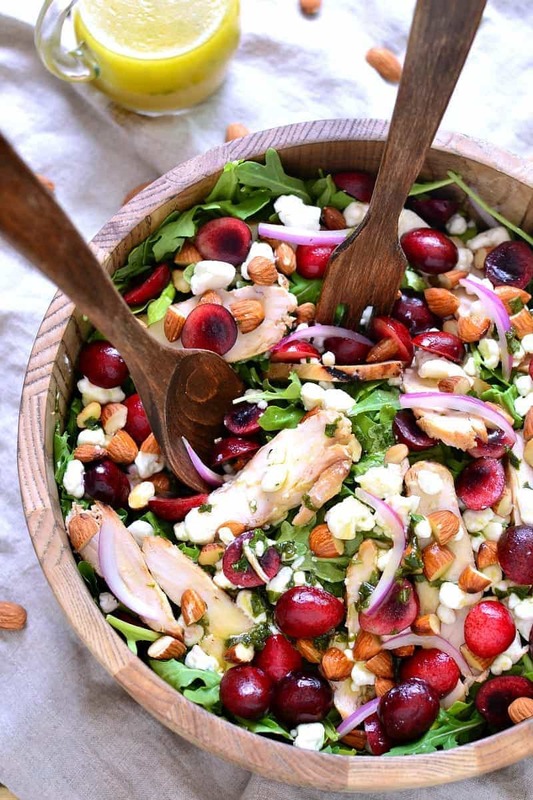 This Cherry Almond Arugula Salad combines fresh baby arugula with sweet cherries, almonds, goat cheese, and grilled chicken for delicious summer salad that's perfect as a main dish or on the side! 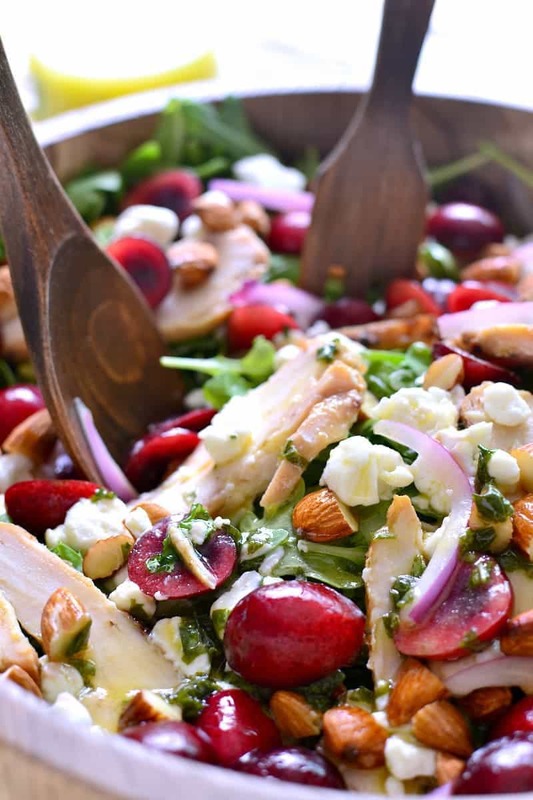 In a large salad bowl, layer arugula with cherries, chicken breast, almonds, goat cheese, and onion. 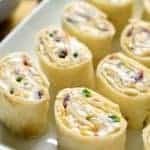 Combine dressing ingredients and shake well; drizzle on salad as desired. *You may not use all of the dressing. Enjoy those kiddos this summer! 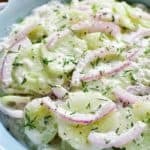 This salad looks lovely and delicious — can’t wait to try it! I think every mom is thinking the same thing right now, lol. Now let’s talk about that salad because Girl, I am dying over here! 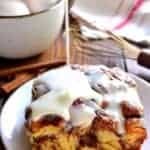 I need to get my hands on some cherries, and fast! I would have a lunch date with you any day, especially if this gorgeous salad is involved!! 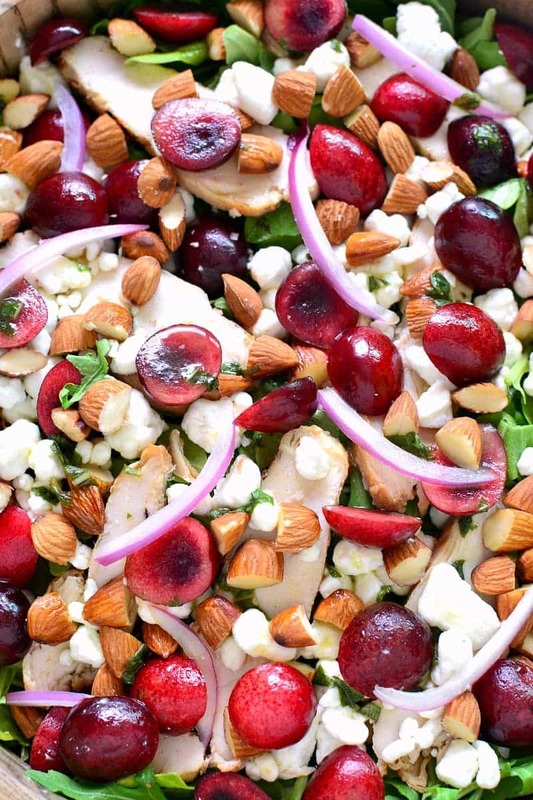 THAT is one of the most gorgeous looking and sounding salads I’ve seen in a long time – love it! 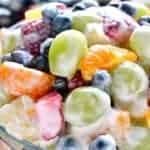 This is one fresh and flavorful salad!! This salad is perfection! 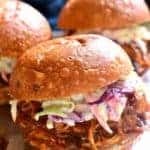 I love each and every ingredient you’ve used, and together I’ll bet they’re amazing! I’m pinning and can’t wait to make this. 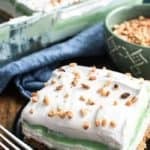 Cherry and almond go so well together! 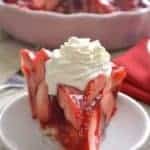 perfect salad! This salad is so gorgeous! 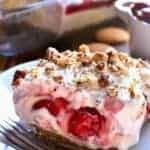 Love the addition of cherries! I’ll be your pseudo lunch date any time! Good luck having the kids home — it is exhausting, and of course I didn’t work ahead either. 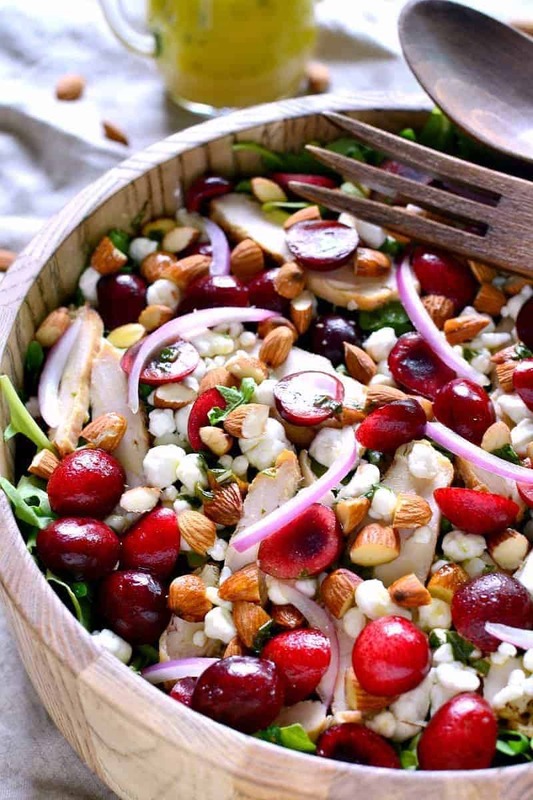 🙂 This salad looks delicious — I love all those cherries and that goat cheese! What a gorgeous salad!! I’m digging the flavor combos! This turned out great, a really tasty salad. I did not make the chicken, instead I paired it with a seared duck breast with a balsamic cherry glaze.